Body Select Body 2D Convertible 2D Coupe 2D Hatchback 2D Sport Utility 2D Standard Cab 2dr Car 3D Cargo Van 3D Hatchback 3D Low Roof Wagon 3dr Car 4 Door Extended Cab Pickup 4D Access Cab 4D Crew Cab 4D CrewMax 4D Double Cab 4D Extended Cab 4D Hatchback 4D Passenger Van 4D Sedan 4D Sport Utility 4D SuperCrew 4dr Car 5D Hatchback Convertible Coupe Crew Cab Crew Pickup Double Cab Extended Passenger Van Full-size Cargo Van Hatchback King Cab Long Bed Mini-van, Passenger Minivan Other SUV Sedan Short Bed Sport Utility Standard Bed Station Wagon Supercrew Wagon Wagon 4 Dr.
George made my car-buying process very smooth. I simply sent him an email specifying what I was looking for, and he had a list of cars for me the very next day. 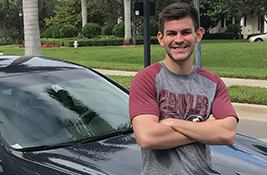 I was going to school in Tallahassee at the time and was skeptical about buying a car in a different city, but George made the entire process seamless and pain-free. Once I picked out the vehicle I wanted, he drove all the way down to Coconut Creek to check it out and assured me it was a great value. He sent me all of the paperwork I needed overnight at no additional charge, so I was able to complete the whole process in one week. The car was waiting for me in my driveway when I got back home. I’ve had my car for about three weeks now and I couldn’t be happier. Ryan worked with AutoAdvisors when he bought his car. Call AutoAdvisors now at (800) 929-8971 so we can help you save too. Velocity Community Credit Union and Auto Advisors put you into the drivers seat. Our goal is to find you the perfect car while saving you time and money. Our long standing relationship with Velocity Community Credit Union enables us to put your needs first. Call (800) 929-8971 or fill out the form above now to get started.